Most people give their best to decorate the living and dining rooms. They do so because all the guests and the family will spend most of their time right there during the holidays. However, the bedroom shouldn’t be left out and you should decorate it just to please yourself. Red, green, gold and silver are the most significant colors of Christmas. However, the bedroom shouldn’t be entirely dressed in these colors. This room’s primary purpose is relaxation and rest, and that is why you should only incorporate hints of these colors. You can do so through the bedding, pillows and a few of the ornaments. Pick white bedding but make it more festive with a red and green blanket, patterned Christmas throw pillows and a bowl of ornaments on the nightstand. By modestly decorating your bedroom, you will provide the holiday spirit but you will also preserve the tranquilizing atmosphere in your relaxation sanctuary. Everything in here should be soft and warm. The best way to provide that softness is through fabrics. On your bed only the coziest linens and blankets should have a special place, while their colors can correspond to the colors of the holidays. Also, you can spread a new soft faux fur rug, and a few more hints of the same material on the armchair. The holiday throw pillows should be made of natural fabrics and you can even spread a few checked scarves at the base of the bed and on the chairs. All this cozy fabrics will cheer up your simple bedroom, and they will contribute to the warm holiday season. Even though the big Christmas tree found its place in the living room, that doesn’t mean you can’t have one in the bedroom, as well. Find a smaller tree that can fit in the corner of the bedroom or on the night stand. Decorate with small ornaments in gold and silver and voila! Your cute little tree will elevate the look of the bedroom while it lights up the atmosphere for the upcoming holidays. As it is already mentioned you can decorate your bed with the colorful bedding. All you have to do is find the bedding with Christmas patterns and you are done. However, if you wish to keep it more subtle, you can leave the bedding white, but add some finishing touches on the frame of the bed. You can hang up a garland on the headboard and provide some Christmas colors through it, or you can hang up a few gray and red stockings at the base. However, don’t stop here; you can treat your spouse and yourself with the best Christmas gift – a brand new mattress. Start a search for an online mattress on time and complete the décor with a comfy place to rest. 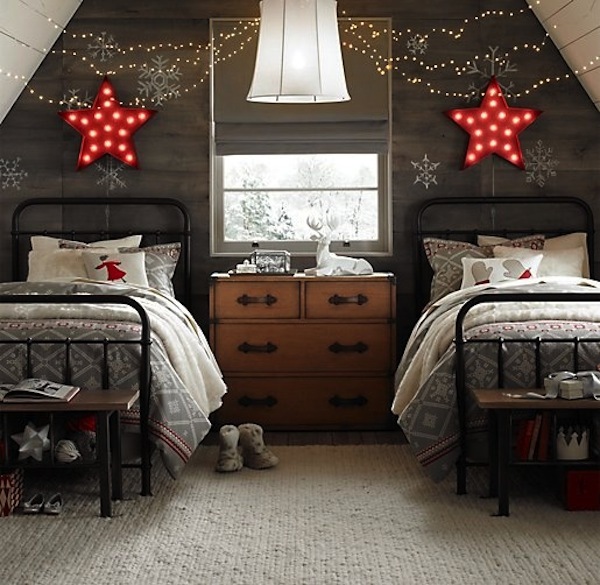 If you haven’t already done this, this Christmas you should incorporate nature in your bedroom décor. A couple of evergreen wreaths with a small red bow above the bed and on the window will suffice. However, if you want more holiday spirit, you can put up an evergreen garland on the head board and decorate it with oranges, limes and lemons for the sweet natural smell of Christmas. This is all about simplicity. While you can go crazy with the ornaments and colors in the living room, in the bedroom you need to be moderate. Red and green colors can perfectly be incorporated into modern looks of a bedroom through simple garlands with red ornaments, hues of red on the drapes and by painting the bed frame. There you have it – adorable décor for your bedroom. Just remember to keep it simple and to add hints of Christmas in there. As soon as you are finished, the whole atmosphere will change and you will be ready for the merriments of the holiday season.